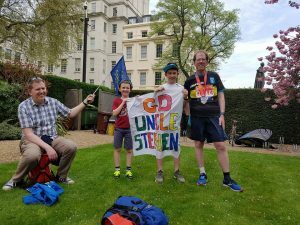 I completed my first marathon in the hottest London Marathon yet, with wonderful support from family and friends coming to London and many others more remotely. The crowd support was quite extraordinary. In common with almost everyone in the race, my time was slower than originally planned – in my case a knee niggle adding to the impact of the sun and warmth. Thanks to the generosity of so many, I exceeded my fundraising target. 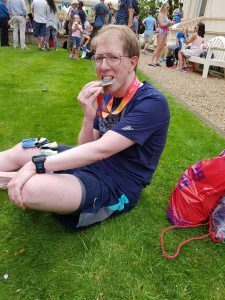 A great day for me, though tinged with sadness at the news that Matt Campbell, one of the many runners who collapsed during the run, has since died. I’d stayed overnight in Gravesend in order to avoid a very early start from Suffolk, and so woke at 3am and couldn’t get back to sleep. I had at least gone to sleep at 9pm so still had a reasonable rest. At 4.30am I realised that, though I’d written an extensive packing list some time ago, the list was deficient in two items, viz. my bandana/buff which I’ve been using as a loose wristband for the last few weeks, and my headband. Neither is critical but it was annoying, though illustrates a danger of relying too much on packing lists. I sent Lucy a message in the hope that she could bring them with her and pass them to me in Woolwich. Getting out of bed and searching in vain for those items made going back to sleep all the more unlikely. The text message from London Marathon at 5.06am telling us it was going to be warm didn’t help, either. Final test of the kit on Saturday. Note the absence of buff and headband. 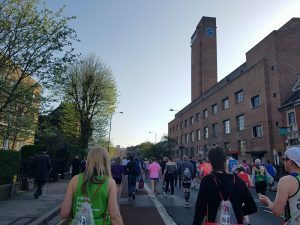 I got up at 6 and left the hotel at 7, driving to Dartford, where I caught the train, mostly full of fellow marathoners; I chatted with a couple of them, one a first-timer and one who’d run it last year. From Greenwich station it was a short walk into Greenwich Park, and up the hill of The Avenue. This was the first time I’d walked up this hill: I ran up it three times in a 10k race which is still officially my 10k PB but the true distance of which I have doubts about. On my way up the hill, a marshal said “Good luck, Stephen” – reading my name from my top. I suppose I should have expected it, but it still felt surprising the first time, and felt good. At the top I entered the runners area. 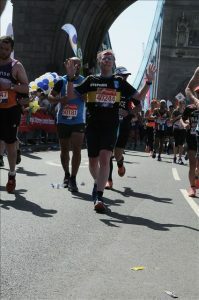 I picked up a free bottle of Lucozade Sport to drink gradually before the start, and made my first visit to the toilet. I sat down and enjoyed the beautiful morning in Greenwich Park, and had my first banana, then decided to drop off my kit bag on the luggage lorry. Noticing that the toilet queues were now lengthening significantly, I joined one for the second visit. I found myself queuing with Mel Elliot, who had got married earlier this morning and was running the marathon with her new husband, James. She invited us to join her for a celebratory Lucozade at mile 7. The queue moved faster than I really wanted, which left me wondering whether to join again or to move towards the start pens. I decided that I would be fine, and went to the largely empty start pens, and sat down on the kerb at the back of pen 5 and had my second banana and gradually finished the Lucozade Sport. A woman came and sat next to me and we chatted for a while till the pen was fairly full and we decided to stand up. From the back of start pen 5, looking back across pens 6, 7 and 8. The 4-hour pacers were at the back of the pen, as I’d known they would be. All the advice in recent days had been to moderate ambitions due to the forecast record heat. I’d struggled to give up my dream goal too easily, and the best that my head got in its battle with my heart was to try 3 miles at goal pace and see how it went. The race started at 10.00, and about 10.10 we started to creep forwards. Having told those visiting London and further afield that they would be able to follow me via the Garmin Livetrack system whereby my Garmin GPS watch feeds my position out via my phone, I then spent a frantic 10 minutes repeatedly trying to get an Internet connection on my phone to set it going – the crowds of runners and spectators together saturating the mobile phone networks. Eventually I managed to get a connection, and hoped that it would work well enough during the day to be of some use to those trying to meet up with me. We finally crossed the start line just before 10.28. Despite the phased release of the runners, the thing that was immediately apparent was how busy the course was. There were periods when there was enough room, then periods when I was repeatedly slowed down behind someone before finding a way to squeeze between two slower runners or weave round them. The 4-hour pacers gradually slipped away and I decided I would be quite happy with 4:12, one of my original goals. At the bottom of the hill around 3 miles, we turned west towards central London. A short while later I found Lucy waving a flag – at this point I couldn’t read it as it was rather furled up, but I later saw it said “Go Stephen”. She passed me my headband and buff, and I gave her my hat, which I was worried would make me hotter, though it would have prevented my head from getting sunburnt. The crowds continued to line every metre of available space. Some areas were quieter than others, but there was nowhere that could be called quiet. In common with most other people in the race, I’d had my name printed on my top, and there were a few calls of “Go Stephen” and the like, though a significant proportion, maybe a majority, of the people of SE London pronounced it “Go Stefan” which was mildly irritating. Later on, the people in central London were all correct in their pronunciation – no Stefans there. The water started to be provided at mile 3, after which it was approximately every mile. Original advice had been to make it clear that you don’t need to take water every mile (most people collapsing have drunk too much, not too little, and when the marathon had run out of water in a couple of earlier years, the number of people collapsing went down), but in the light of the hot weather, the emphasis in the advice had changed, and at Expo on Thursday the focus was more on not taking more than one bottle per water station, and using some of the water to cool one’s body. So I took water at every place available, drank a small bit and used the rest to cool my arms, hands, neck and top of head. Because most people were doing similarly, rather than skipping one or two water stations, they were particularly busy and slowed progress a little. I gather that later in the race, the supply ran out at some places. 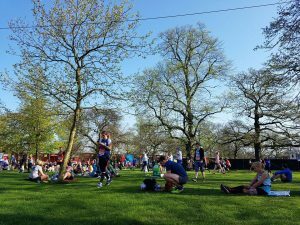 Although I saw quite a few fellow runners collapsed by the side (particularly in the middle stages) receiving medical attention, I didn’t feel hot or troubled. I monitored my pace but didn’t try to push it at all, just running at what felt like a comfortable speed, and one which was around 4:12 pace for a good while. Even that slipped slightly, but I didn’t let it worry me, continuing at what felt right with the time pressure now off. Between miles 6 and 7 we went around the Cutty Sark, a real landmark on the route, and one which spectators were advised to avoid due to over-crowding. It was busy, but from my brief perspective not really any busier than lots of other places: with the growing popularity of the event, coupled with the great weather for spectating, the numbers of people out on the course as a whole must surely have been a record. I knew my parents were at Surrey Quays just before mile 9, but didn’t have a good grasp of where exactly, and spotting anyone in the huge crowds as one goes past at 6mph is a big challenge, so I missed them. 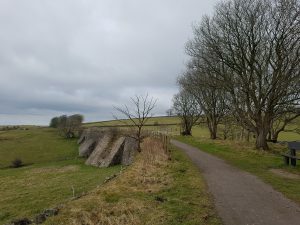 With a map in front of me now, I can see that they would have been on the left hand side, as proved by the photo they took, but while running along I didn’t even have that in my head so was trying to watch both sides at once. Next landmark for me was the Guide Dogs cheering station, where I expected Lucy to be as well. To be honest the cheering spot felt slightly lost in the general huge level of noise, with lots of other charity cheering spots too. The crowd in general was so loud that quite a few people had brought speakers or loudhailers to help them be heard. I briefly waved at the Guide Dogs people, thinking perhaps I’d seen Lucy with a borrowed megaphone, though I wasn’t sure – it turns out it was a total stranger who I gave a big smile to. The cheering point had apparently been moved slightly, and Lucy wasn’t there but nearby. Shortly after, as I approached mile 12, I got a message from my brother to say he and family were at mile 12, but unfortunately I didn’t spot them, either. Crossing Tower Bridge is the next landmark, and in a world where the word “iconic” is overused, it is perhaps justified here. Looking up at the towers outlined against the blue sky was beautiful, and the bridge was lined with roaring crowds, albeit if anything quieter than the streets in the mile approaching the bridge. The gentle hill leading up to the bridge felt easy, and the hill down on the other side even easier and made that section with the electric atmosphere even more enjoyable. My friend Claire was on the far side somewhere, but I didn’t see her either, so that was four failures in row – very difficult to spot people in the crowd, even more so without complete precision as to their location. Turning right along The Highway, we saw the faster (and earlier starting) runners going the other way about nine miles ahead, and soon after passed the 13.1-mile half-way mark. We’d been warned that this is much quieter than Tower Bridge, and that the combination of the realisation that there are still 13 miles to go, seeing the runners so far ahead, and the relative quietness, can be mentally challenging. 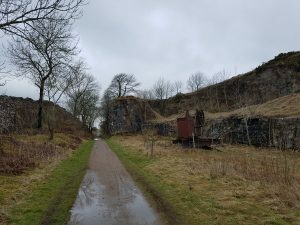 I didn’t find it so – there are always going to be people behind me and in front of me, the promised quietness didn’t materialise even slightly, and though I’d slowed a bit, I was still feeling quite strong. 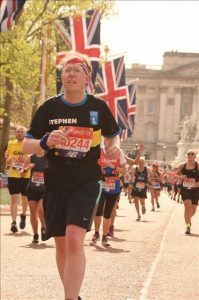 In 2009 I ran the Reading Half-Marathon, and my right knee gave out at about 11 miles in, and though I could walk the last two miles, it didn’t let me so much as jog a few paces. The knee hasn’t much troubled me since, but today it did start to bother me. When I got to mile 15, I found my ability to maintain the pace ended quite abruptly, in significant part due to the knee suddenly troubling me much more. I dropped to a walk for a little while, then tried a run again, and quickly settled to a routine of between 2 and 3 minutes’ run, followed by 1 minute of walking, which together produced about 8-minute kilometres. This was much slower than I’d hoped to be going, but now the important thing was to finish, and I found this was something I could maintain. As I ran south down the Isle of Dogs peninsular, I found myself alongside a man dressed as a toilet for quite a while. The crowd all around were roaring “Go toilet!”, which is the command we use when we want the dogs to evacuate themselves. 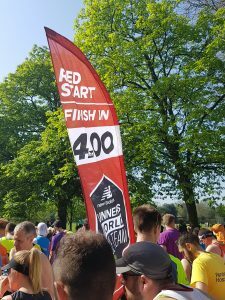 As I was contemplating whether I needed to join the queues at the toilets along the course, it wasn’t helpful to have my attention continually drawn to this, so I was glad when our paths diverged. Fortunately, my brief need to stop also evaporated and didn’t return. 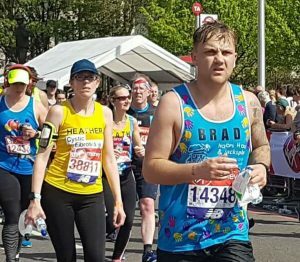 Most of the runners were in ordinary running clothing, albeit a lot of us wearing our charities’ tops, but of course there are quite a few in fancy dress – many of them starting behind me. 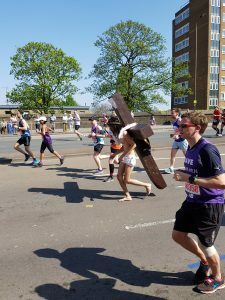 In addition to the toilet, among many others I recall passing a man carrying a tractor, a man as an X-Wing fighter, a man carrying a tumble-drier on his back (it was reassuring to go past him), and a barefoot Jesus carrying a cross, plus a group of Grenfell Tower firefighters in full kit. Lucy had been able to give me very clear information as to where she next was, and I picked her and her flag out easily at Km 30. It was really great to see her. 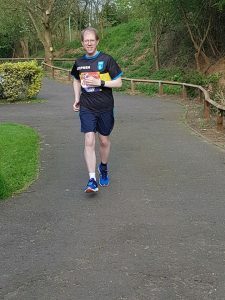 While my slower run/walk technique was still holding out, I was rather anxious about whether I could maintain it and whether I would finish at all. My knee was sometimes hurting towards the end of the two to three minutes, but the walk break was allowing it to recover so it didn’t bother me at all at the start of the little runs, but would that continue? In Reading in 2009, it gave out very suddenly, going almost immediately from painful to unrunnable. As we ran towards and onto the Aspen Way dual carriageway, we had one of the very few lulls from crowds lining the route. That was soon followed by the left turn into Poplar High Street, now heading west once more towards central London, soon followed by the Mile 20 gantry and it suddenly felt like the home straight, the end was metaphorically in sight and I started to relax again. I’d heard before that a marathon is a 10k race with a 20-mile warm-up, and that seemed a very odd way of putting it, but certainly having less than 10k to go did feel a notable milestone in conjunction with the change of direction. Crowds thronged The Highway to an even greater extent on the way back, and the “Go Stephen” calls were very motivating. I’d heard that these calls are great at the start but can be annoying by the end, but I didn’t need them early on but later they were helpful, especially when I could see the individuals calling out and thank them personally – eye contact making a definite difference. 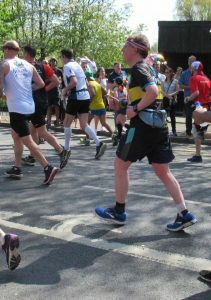 As I neared the end of The Highway, coaches were passing along the other way, nine miles behind me, presumably mopping up the slowest runners, either requiring them to get on the coach or to move onto the pavement to complete their run as the road closures began to be lifted. At Tower Hill, I found Claire and we exchanged a high-five – great to see another familiar face. From here, the crowds continued thick and loud for every step of the way, with even more enthusiasm for calling out support to individual runners. My run/walk strategy was continuing to work for me. I had enough energy gradually to speed up as I progressed from mile 15 to mile 26, by running slightly faster or with longer run sections, but I kept listening to my knee to drop back to the regular brisk walks, and was content to enjoy the experience now there was no time pressure. 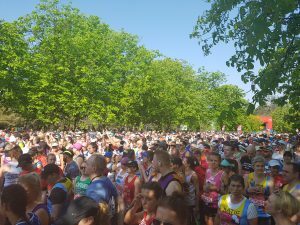 If I had been pushing the pace, the very crowded nature of the course would have been much more frustrating – it was busy early on, then eased off, but by now seemed even busier, with lots of people doing the same as me, run/walking. That was fine when I was ready to walk, as I checked behind me, moved to the side and broke into a walk. But when I wanted to run, it was difficult to do so without lots and lots of dodging and weaving, which adds both distance and effort. Even without that, if everyone had been going at the same pace as each other, any hope of following the dotted blue line on the road which is the 42,195-metre route is impossible unless you are very near the front of the race. This was the busiest race I’ve run by some margin: I’ve had some busy starts, but no crowded conditions 80% of the way through. 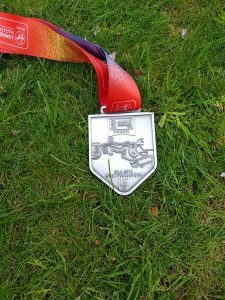 Looking back at the half-marathon PB which contributed to my pace confidence, it was done on a cool morning, on an almost deserted route, almost completely straight, without having to stop for drink or food or cooling showers. Of course, it was done without any taper, and without any race buzz or crowd support, either, so the factors split both ways. The crowds lining the route got even busier as we went along Lower Thames Street and along The Embankment. Near Hungerford Bridge I was looking for a first aid station where Mark, Debbie, Ben and Thomas were located, with an assumption that Mum and Dad might be there too. I never saw the first-aiders but did hear a call from the crowd and turned to see the family cheering me on, which was great. Lucy was somewhere at the end of Whitehall for her final spot, apparently opposite some music, which I looked out for, but the crowd was so loud I didn’t hear the music until I was past it. I turned to look over my shoulder for Lucy and ran into the back of the man in front of me, so refocussed my attention on the remaining kilometre. Although I was now full of energy, relatively speaking, and the large majority of my legs would have let me run much faster, conscious of the knee I deliberately timed my walk session to take me to the “385 yards to go” bridge, so that I could be sure of running those last 385 yards without break. And then it was the magical turn onto The Mall, the finish line, and it was done: I had finished. My finish time was 4:52:11, making me 21,131st of 40,149 finishers. Considerably slower than hoped or planned, but in the record warmth (officially 24.1°C) and with a knee injury, still something to be pleased with. A slow walk followed, to be awarded my medal, pick up my goody bag, and then collect my kit bag from the appropriate luggage lorry. I looked for Marion, who was one of the volunteers on goody bags, but didn’t spot her and my mind was not focused for a long search. Once I had my kit bag, I mixed my recovery drink and downed that. I could see the Guide Dogs reception up to my left at the Institute for Government, but I had to take the long way around, past all the prostrate runners, out through the exit, up the steps to the Duke of York’s statue and along Carlton House Terrace. Lucy was arriving at the same time, and we chatted for a little while with one of the many people benefiting from a guide dog. I popped upstairs and got a little bit of food, by which time Mark, Debbie, Ben and Thomas had arrived. We had some quiet family time, interspersed with a massage and shower for me. Eventually we set off home, pausing for a photo with a guide dog. Sore thighs, but they let me go for a 3km run on Tuesday morning. A slightly bruised second toe on my left foot, but I think the toenail will survive. A sunburnt head – maybe I should have kept that hat on after all. Cramping feet on Sunday evening which made getting to sleep difficult. Sickness due to sunstroke during Sunday night. And of course that knee. But all in all, fairly modest impacts. No blisters. Remarkably little hunger – not the raging insatiable hunger I’ve had after many shorter runs. By Monday morning, I was 2.5kg lighter than Saturday morning, so still some fluids to replace. 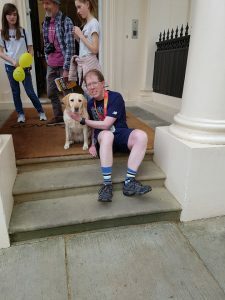 Thanks to the generosity of so many friends and family, I met and exceeded my fundraising target for Guide Dogs, which is fabulous – thank you. A number of people have asked: would I do it again? Maybe, one day. A part of me would like to do it in cooler conditions, with a knee that behaved itself. I know I have it in me to get close to four hours. But it did consume a large part of my life in training, and while I really enjoyed that focus and the new opportunities, I’m not sure I want that to be the new normal. And my knee was clearly not happy. So for the moment at any rate, a return to shorter distances. 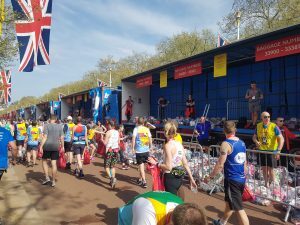 As I approach my run in the London Marathon this Sunday, I wanted to thank you for your support, through your words of encouragement and morale-boosting. I am feeling excited but also a little nervous in advance of my first marathon, but I think that’s normal. It is said that running is a series of arguments between the part of your brain that wants to stop and the part that wants to keep going. 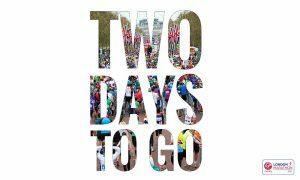 The support from you all, in various ways and at various times, has helped that second part of my brain, to motivate me to keep going through training, and will help me as the streets of London stretch out in front of me on Sunday. I am also very grateful for the generosity of sponsorship from so many of you. Some of the sponsorship online has been anonymous, which is understandable, but leaves me unable to thank those people directly, but thank you all – you are awesome! As I write, I am 94% of the way towards my sponsorship target, raising money for Guide Dogs for the Blind. If any who haven’t sponsored me feel able to help this important cause, and help me to help them make a difference, and reach and surpass that target, then sponsorship at virginmoneygiving.com/StephenD would be really appreciated – or money via other routes is fine too (including after the race). Also, while I’m not a big Twitter user, my Garmin GPS watch will tweet a link to a live map of where I am – you don’t need a Twitter account, just go to twitter.com/StephenRDawson after say 10.30am on Sunday and follow the link which should be there by then. Training has gone well, with no injuries other than a few blisters on my toes. I reached a long run of 22 miles at Easter, albeit deliberately slower than planned for the big day, since when I’ve been gradually reducing the mileage to let my body rest and recover. Some of the winter training has been very cold and with some floods to splash or wade through, but most has been enjoyable, and it’s been fun to challenge myself and execute the plan successfully. Just one run to go now! A pleasant run 24km this morning, mostly on lanes towards Diss but including about a mile on a rather muddy byway. There were a few spits and spots of rain, but not enough to wet the ground, and getting distinctly warm towards the end. I found myself racing the postman in his van for several miles – it was a pretty evenly matched contest as he needed to stop so many times. With two weeks to go till London, I still remain in a dither of doubt about what my target marathon pace should be. In an attempt to address that, this morning’s run was deliberately intended to be at 3:59-marathon pace. My logic beforehand was that as I ran an easier 22 miles last weekend fairly easily with energy left at the end, and if I could run at 3:59-marathon pace for 15 miles today on not well-rested legs without the boost from the occasion, the crowd, the fellow runners, etc, then it wouldn’t be a totally unreasonable target pace on the big day. I kept nice even splits throughout, and finished a few seconds ahead of schedule, but finished in as much doubt as when I started. There’s a long way from 15 to 26 miles, and the last two today weren’t easy. Maybe I should adopt 4:05 or 4:10 as my target and take the pressure off myself. The VDOT app on my phone says the half-marathon time a fortnight ago is equivalent to a 3:59:01 marathon time, which is encouraging. The Running Calculator app on my phone says the half-marathon time a fortnight ago is equivalent to a 4:13:10 marathon time, which is less so. But on a more positive note, today is the 10th anniversary of my first outdoor run – I’ve come a long way from the boy/man who couldn’t run. 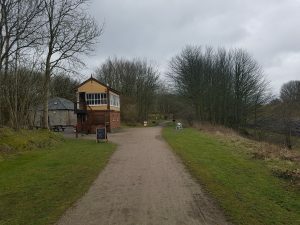 I ran 35km this morning on the High Peak and Tissington Trails in the Peak District, starting from Middleton Top. 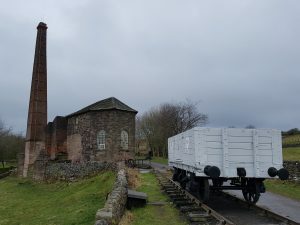 (The photo shows a wagon at the top of Sheep Pasture Incline and the engine house which used to pull the wagons up the 1:8 incline). This was my longest run yet, done in 3h38. Despite overcast weather it was a glorious run in beautiful scenery. There were a few spots of rain but nothing that amounted even to a shower; there was some lying snow remaining from drifts in one cutting, but otherwise I saw none all day. 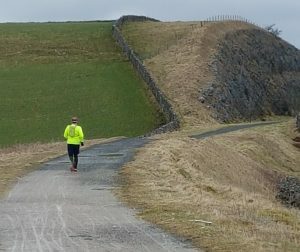 Lucy and I and the dogs have been spending the Easter weekend in a cottage in Wirksworth, and Lucy drove along the route, stopping from time to time to cheer me on, walk the dogs several times, and provide me with supplies – great fun (for me, anyway)! The benefits of large-scale crowd support are well known, but even a solitary cheerer is still both uplifting and distracting. I had the route almost to myself for the first half: indeed I saw 1 walker, 2 runners and 7 cyclists in the first 10km. But by the time I got to 30km, I stopped counting – at that point I had 92 walkers, 24 dogs, 6 runners and 100 cyclists, and the total would rapidly have increased after that – the last couple of kilometres were on the verge of getting tedious with people walking four abreast on the path and oblivious to other users (me!). I was very pleased with how it went, and if it hadn’t been increasingly busy I might have considered doing a little more since although I was tired I definitely had more in the tank, but this was plenty as a training run and to give me further confidence for the full 42.2km. Within the constraints of access to the route and what I could ask of Lucy, nutrition was very close to marathon day. I took my Camelbak with some water, but didn’t use much of it, so in comparison to the big day, I was carrying a little more weight than I will be. I aimed at 6:15/km and overall managed 6:13/km, which was great, with the last mile being the second-fastest. It must be noted that the last 10km were slightly downhill, which definitely takes the edge off the effort, so this isn’t directly comparable with a flat race. It leaves me full of confidence at the prospect of the full distance, but still very unsure how fast I should aim at running. I am going to attempt a marathon-pace 15-miler next weekend, to see how I get on: if I can do that on still moderately tired legs, without complete nutrition, with a bit of up and down, without crowd support and the uplift of the day, then I can do that pace for 26 miles a fortnight later. I was tired afterwards, but not unreasonably so, and went out again in the afternoon to do some walking and exploring. Now the taper starts for London in three weeks.